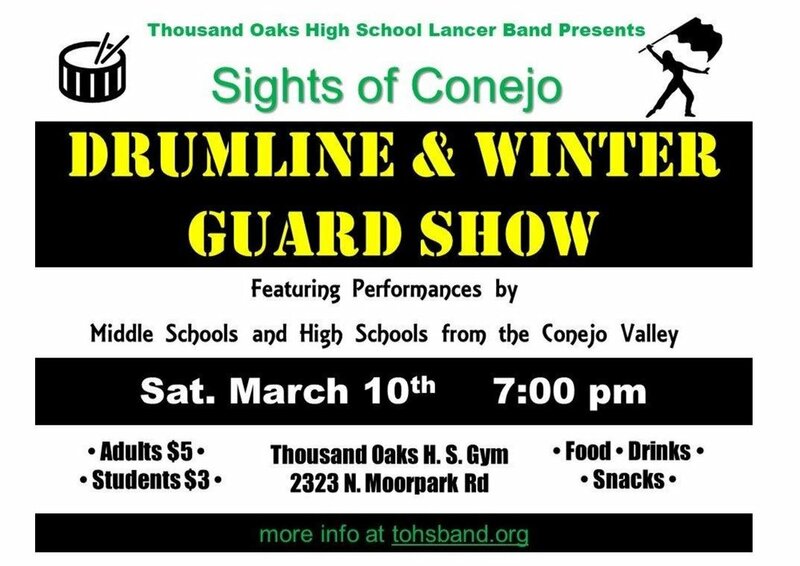 The Thousand Oaks High School Lancer Band will present the 9th Annual Sights of Conejo Drumline and Winter Guard exhibition at 7 on Saturday, March 10, 2018 at the Thousand Oaks High School Gym, 2323 N. Moorpark Road. Doors open at 6 p.m. This event will feature performances by percussion ensembles and/or color guards from middle schools and high schools from the Conejo Valley. Food and refreshments will be available for sale. Tickets are $5 per person and $3 for students at the door, cash only. For more information, visit www.tohsband.org.